How Does Your Garden Grow? | Be Strong. Be Courageous. Be You. ← How Can I Help My Child Improve in Reading? So many exciting things happen on a school campus. It’s hard to keep everyone “in the loop”. One of the most exciting things happening on our campus this school year so far is the garden which is taking shape. The garden is on a part of our campus which wraps around the rear of the school’s property. It’s been an unsightly space for decades, a true eyesore in a neighborhood where beautiful views abound. Our school sits at the mouth of Los Angeles harbor. We can see cruise ships, container ships, sail boats and tug boats come and go all day from our campus. We look out on Angel’s Gate Lighthouse from the front and with a quick walk, we see Catalina Island. It’s a glorious place, with an ugly back side. That is until this year. This year, one person decided to make a difference. He set out to change the back of our school. He set out to create something beautiful where there were only rocks and weeds, broken bottles, trash, and some dead ivy before. Working with facilities to get the water lines repaired and functioning to water the area until the native plants are well established. Months of hot, back-breaking work tearing out all of the weeds. Provide funding, look for funding, secure funding. Donations for the garden welcomed! Getting the decomposed granite (DG) ordered & delivered. Unloading the DG and packing it into the path. Marking places to dig for the native plants to go in. Digging out all the holes. Getting help with digging out all the holes. Clearing away trash that accumulates over the weekends or evenings. There’s more to be done. Let parents know what’s happening. Plan for a Saturday work day to get the plants in before winter comes. Parents have started coming to help dig the holes where the plants will go in. Soon children will be helping to plant some of the small native flowers and shrubs. Even now, children can watch the progress of this once wasteland space transform into a fully beautiful urban garden. Truly one person can make a beautiful difference. Click here to see one school’s vision for a bird & butterfly garden where students can study and learn in nature! How do you add beauty to your world? 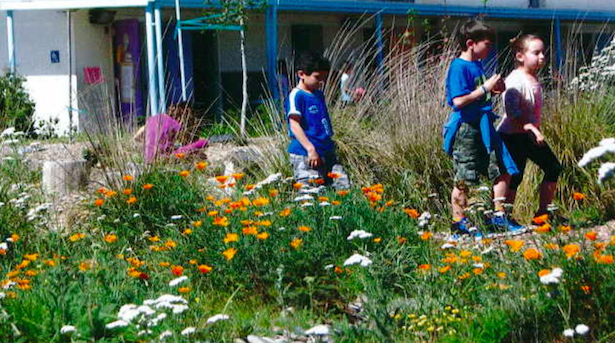 How does your school community celebrate nature? Thank you to Two Writing Teachers for a place to share our stories. Click here for more shared stories on all sorts of topics. This entry was posted in Garden, Learning, make a difference, Principal, San Pedro, Story, video text and tagged school garden. Bookmark the permalink. 3 Responses to How Does Your Garden Grow? Something about dirt and plants and kids. All of it I love. This is a perfect example of cause/effect and problem/solution. So much work, but it will yield so much beauty. Well done! What a beautiful message! Inspiring!